There is a new way to see how late your bus will be due to weather/new driver not turning up/trams that is the EdinBus app for iPhone. Read the story at Greener Leith. Meanwhile buses are set to return to Princes Street for the Xmas shopping binge. 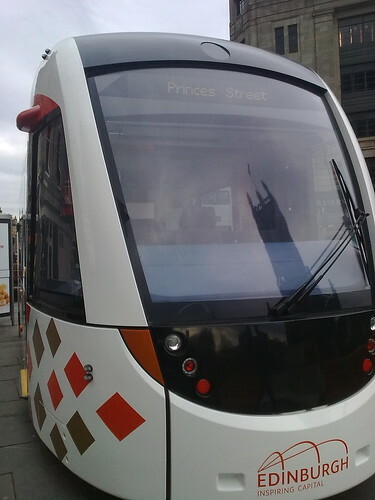 The Evening News quotes council leader Jenny Dawes being fairly upbeat "Walking along Princes Street I hear a lot of comments about trams. Before, the comments used to all be negative, with people saying they don't want the tram, but now I tend to hear people telling others all about it and taking ownership of the tram, which is what we want." Whilst most of the comments seem to disagree with her in rather strong partisan terms, I think that people are beginning to visualise the city with trams running. Now some useful lines would be good, to the University and ERI or north to the Western General would be good. However with Council revenue from property sales collapsing and benefits payouts on the rise I wouldn't hold my breath.